Packaging Dimensions 9 in. x 7 in. x 1.5 in. I just left a review for the PileDriver missing parts. So I went and opened the Thunderdrive to check if the missing capacitor for the Piledriver was there and I would've had to go out for the missing parts. Well, The Thunderdrive was even worse. Basically is missing components, the bag came only with the knobs, switches, and wires, no diodes, no resistors, no capacitors. I'm surprised since all reviews are mostly positive, I guess I was just unlucky but now I lost the holiday break to actually build the projects. Pedal was easy to build and has a nice rumble-like sound. Pretty awesome. Only minor thing was that the battery fits a bit too tight as to make closing the lid a bit hard but 5 stars nonetheless. I've wanted to try DIY pedals, but wasn't excited about other kits based on IC's and PC boards. This simple circuit, done point to point, was a great starting place, and I can actually follow the schematic with a reasonable understanding of what each component is doing. Finished product sounds great...haven't had a chance to compare it to my "boutique" overdrives, but it was worth the money for the fun of building it and having a decent sounding pedal. It would help if instructions could be modified to do some "pre-assembly" outside of the box (I figured out some of this on my own). Also, the pre-drilled box presented some challenges; the foot switch could stand to be about 1/8" further forward to give some wiggle room for the battery. I had to grind down the lip on the back panel on one corner in order for it to fit properly over the battery. Moving the switch would probably mean moving the jacks as well, but if you rotated the terminal strip 90 degrees, that would free up some space. I'll upload pix shortly. I purchased this with the intention of modifying the original circuit. I used a 2n3904 and a nte123ap in a cascaded darlington configuration and I used a germanium diode with red led instead of the provided pair of silicon diodes. It functions as a dirty boost but when pushed, it has a raspy aggressive distortion with asymmetrical clipping that closely resembles early Led Zeppelin tones. 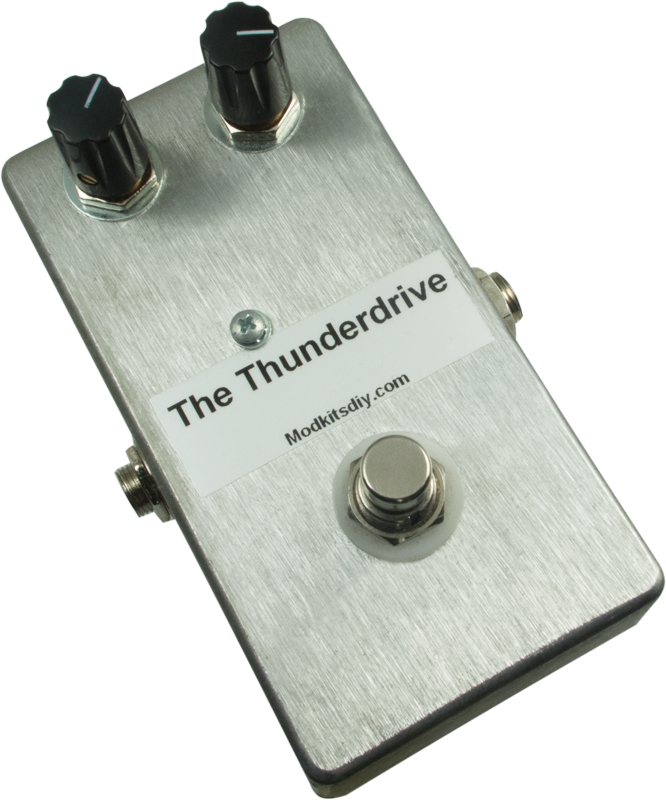 The Thunderdrive is a good kit for beginners wanting to try their hand at making a useable pedal. 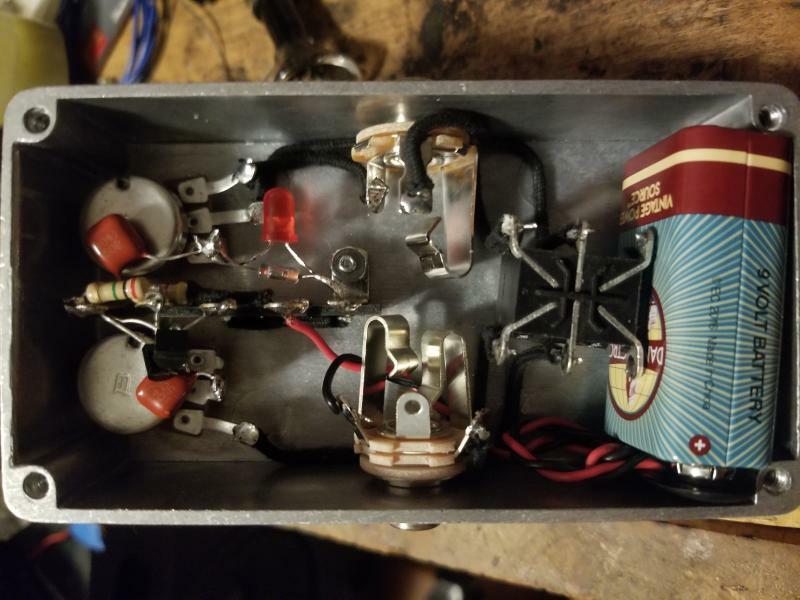 The kit came exactly as described, the instructions were easy to follow, and the pedal functions more or less as advertised in the blurb. Its best use, to me, is as a clean boost when you want your guitar to jump out of the mix for solos. It does this quite well, although I'd recommend getting the Thunderdrive Deluxe kit for a bit more money so you'll have an LED. A few cautions: 1) Don't build this kit thinking you'll get anything on the level of a Tubescreamer, SD-1, Bad Monkey, etc. The "overdrive" effect is very rudimentary -- more a mild fuzz with a late 60s vibe, which can be useful in its own right. 2) Once the battery is inside the finished unit, the tight fit makes it impossible to fit the back cover onto the unit, because the lip on the inside edge of the cover hits the battery at the corners. To solve this problem, use a file or Dremel tool to file out two corners of the lip (you won't see it once the lid is on) to allow the cover to lie flush so you can screw it on. 3) Although the instructions state that you should mount the terminal strip inside the box before attaching the components, it is much easier if you do most of the basic hookup outside the box, to give you more room to fit and solder the parts. ... Overall, for the price, I was happy with this kit and look forward to moving on to something a bit more challenging. Wow!! This is an amazing product. I have never soldered before, but this kit was so easy to assemble that I didn't bridge any connections and I finished it in two hours!! It looks great and it sounds great and it was a ton of fun!! The battery fits a little tight and there's no DC input jack but I will definitely add this pedal to my board and I will definitely be ordering another kit from this company!! P.S. If you don't like the plain metal enclosure and the sticker, you can use Krylon enamel spray paint and waterslide decals to make custom colors and graphics and you can upgrade the knobs. make it your own. Thanks! This is a very good beginner-level kit. Instructions are clear and easy to follow. Can be completed in a couple of hours. All parts are included (except rubber feet.) The overdrive sounds good through my little Fender Champ. I only completed the kit a couple of days ago so am still experimenting with the sound. If you are looking for a project to get started building guitar pedals, this is a good choice.